Wow it is Sept 1st already. 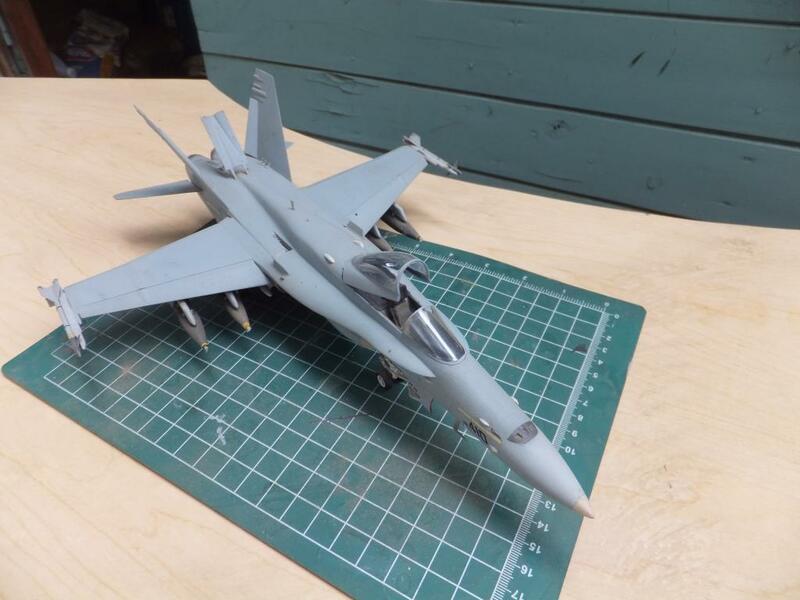 Today we have the Hasegawa F/A-18C Hornet. VFA-81, the Sunliners participated in the 1st Gulf War in January 1991. Operating off the USS Saratoga (CV-60), CVW-17 air wing. Flown by Lt Nick Mongillo with part of a daylight strike package on January 17th, the first daylight strike mission for the squadron. Along with 3 other F/a-18s’s in the flight, flying as wingman to Lt Cdr Fox’s Hornet (401), approaching from the south to hit airfied code named H-3 , flying in a line abreast formation. 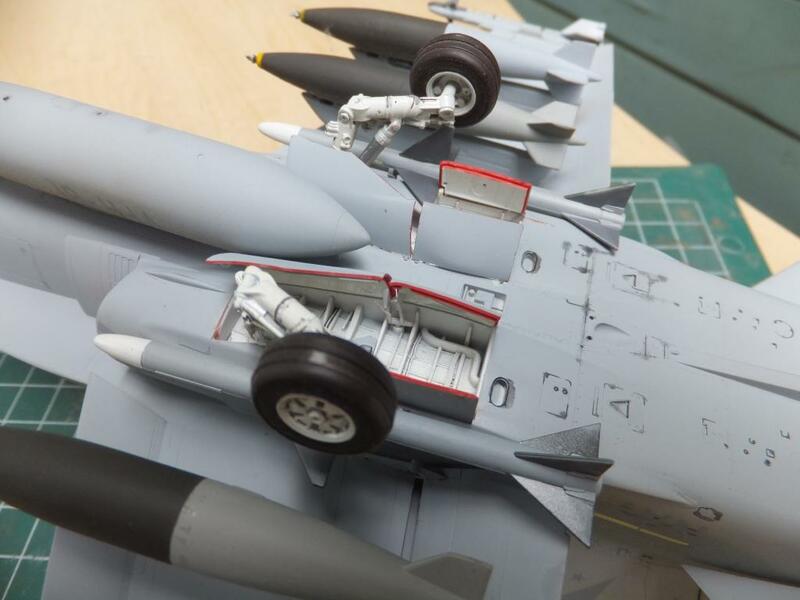 Each aircraft loaded with 4 MK 84 2000lb bombs, 2 AIM-7 Sparrows and 2 AIM-9L Sidewinders, with a center mounted drop tank. As the flight approached the target, 30 miles out, an E-2C Hawkeye VAW-124 alerts bandits in the area, the aircraft already configured for the ground mission, the pilots reset to air to air and select missiles, but maintain course to target. As there had been reports of bandits just shadowing but not attacking. Though Lt Cdr Fox wasn’t taking any chances and kept aware of the approaching danger of the MiG-21’s. Then Lt John Joyce, Air Control Officer (ACO), one of the NFO’s in the E-2, calls urgently “Hornets, bandits on the nose 15 miles” That was it for Fox he calls the flight defensive and turns towards the MiGs, they are approaching on a left echelon, Lt Mongillo locks on the 2nd MiG on the right while Fox has lock on the 1st MiG on the left, they were approaching us at supersonic Mach 1.2, I had lock at 10 miles with an AIM-9. The other 2 Hornets stood back but also had lock on the MiGs as well. Fox fires at the 1st MiG with a Sidewinder but is dismayed as the missile tracked smokeless as it left the rail, not taking chances he quickly switches to the Sparrow and launches it after the Sidewinder. But apparently the Sidewinder was working and hit the MiG then the Sparrow hit the fireball as well. The Sidewinder did the job on it’s own. Splash one MiG 21. Lt Mongillo launches a single Sparrow on the 2nd MiG and took it out, splash 2 MiG 21. The whole event from call of the E-2 to splash of the first MiG took only 40 seconds. Lt Mongillo thought of the pilot in the MiG-21, when he climbed into that cockpit and took on his flight, he knew what he was getting into, I don’t consider myself a steely eyed killer, but this is war and you have to beat the enemy, I probably killed that guy, i don’t have 2nd thoughts. If given the opportunity he would’ve done the same to me, is how I see it. After the kills, the Hornets formed back up to continue the mission and delivered there bombs on target. 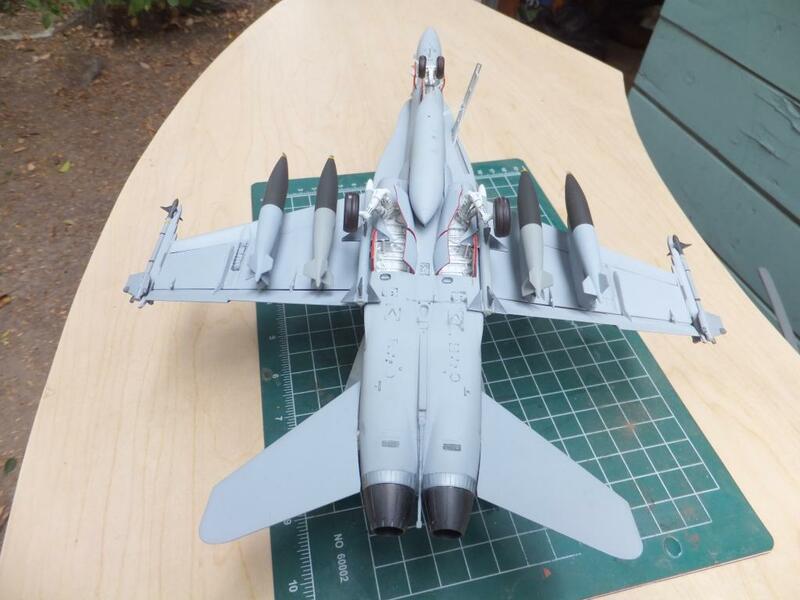 Throughout there engagement with the MiG’s, they still had 8000lbs of bombs hanging on the wings and still performed as advertised, kill MiGs and destroy on ground targets on the same flight. After coming off target and heading south back towards the boat, 2 smoke tails rising up from the desert floor where the MiGs had crashed still in the formation when they were flying, Fox credits his maintenance team for keeping his aircraft up and ready to perform. Also the E-2 crew for their job of vigilance and their timely calls of the approaching danger. We are well trained. 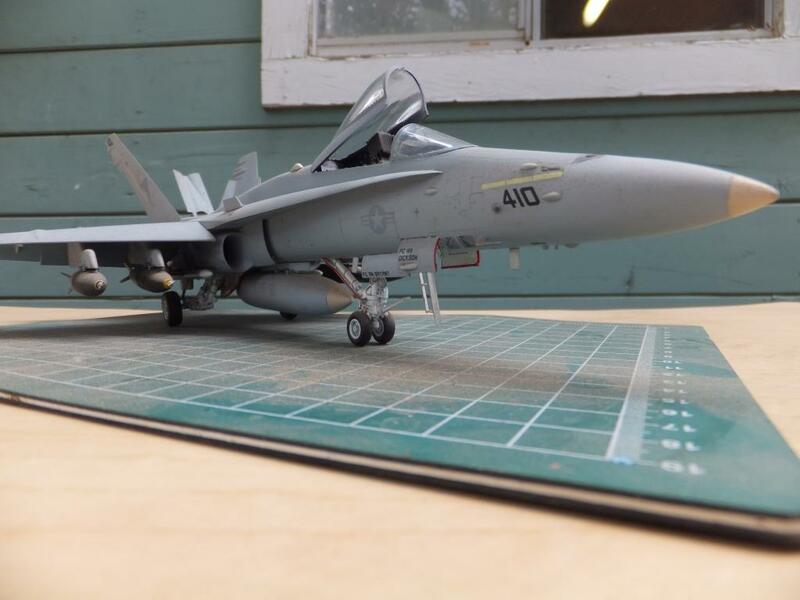 The strike fighter concept of the F/A-18C Hornet is utterly a success. If had those MiG’s somehow got behind us we woulfd’ve had no choice but to jettison the bombs to face them in air to air combat, and they would’ve succeeded in preventing us from completing our mission. But to face the enemy head on, defeat them and to continue our strike is a testament of the Hornet’s abilities. Lt Cdr Fox completed 18 missions before the war ended. 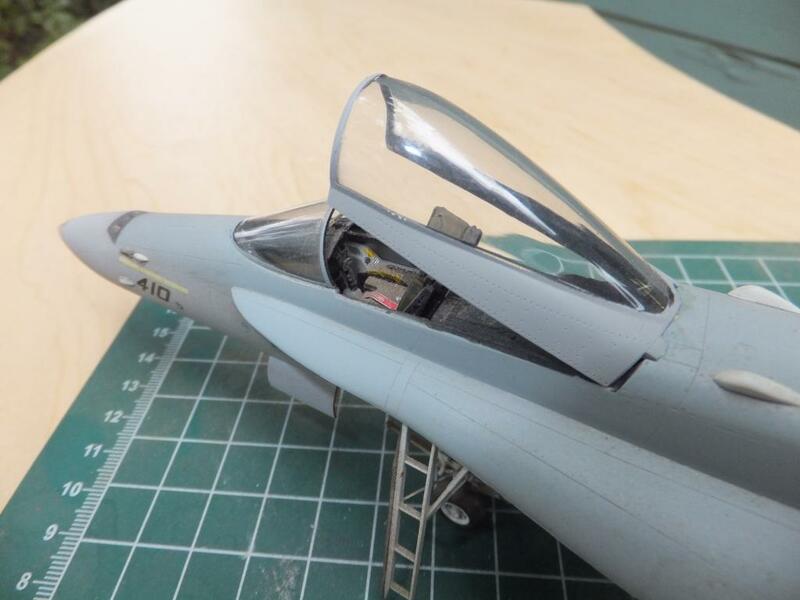 Hasegawa’s series of F/A-18’s were a hit when they first appeared in the early 90’s. 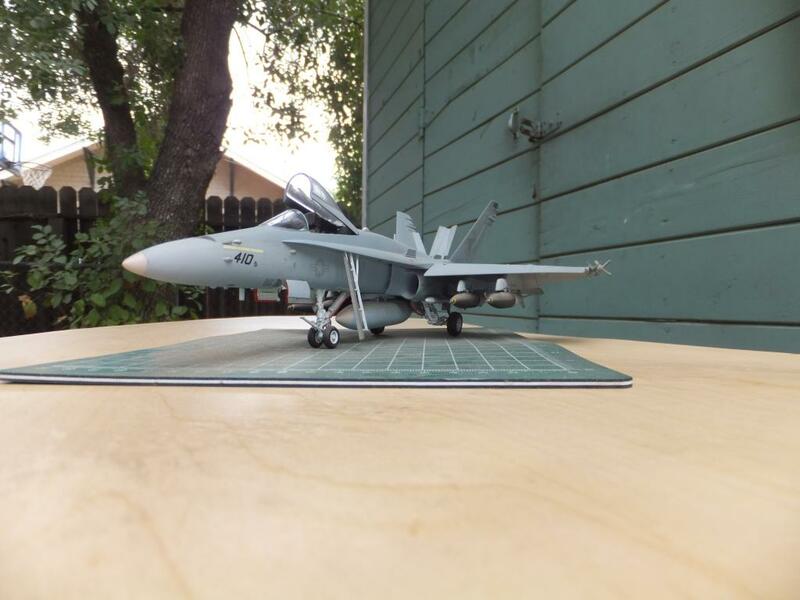 Very expensive, very detailed, lots of parts, and maybe a little over engineered, but not as fussy as their F-14’s. I built this kit back in 1998. It was my first DS storm A/C to start the USN/USMC collection in this scale which I am still working on, and may be a lifetime endeavour. 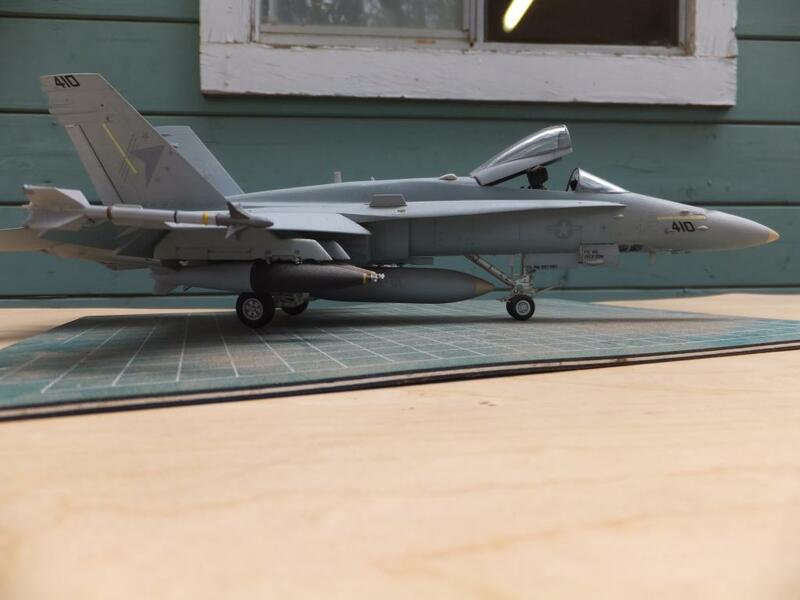 Didn’t use any aftermarket parts on this build, as most of the items were supplied in the kit except for the decals for VFA-81. 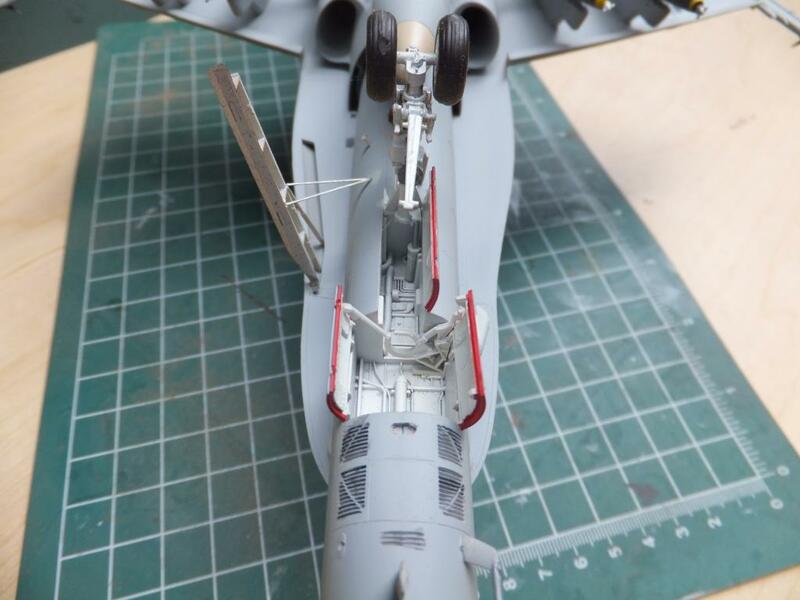 The kit had photo-etch bits and White metal for the landing gear. 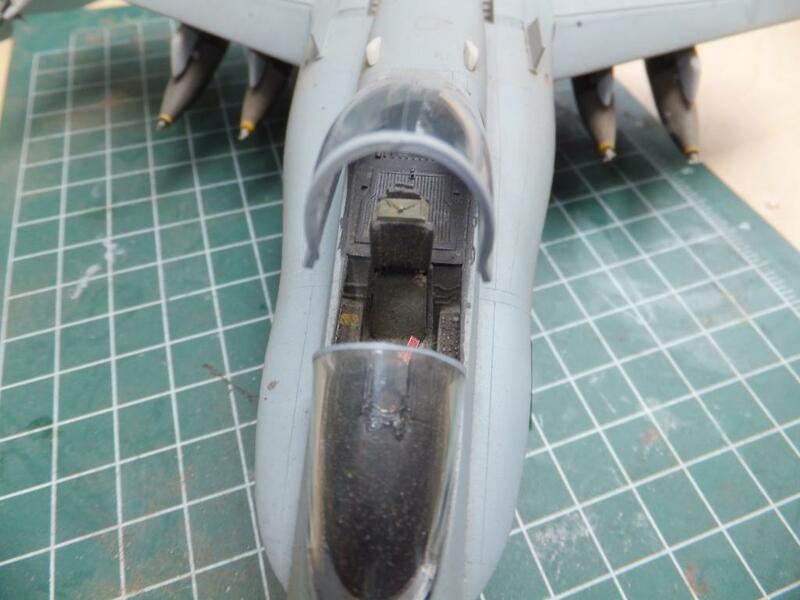 Of course one of the pet peeves that a lot of us had with Hasegawa was the lack of ordnance in these kits. Retail at the time (and still is) over 50.00 USD in the mid 90’s was expensive. 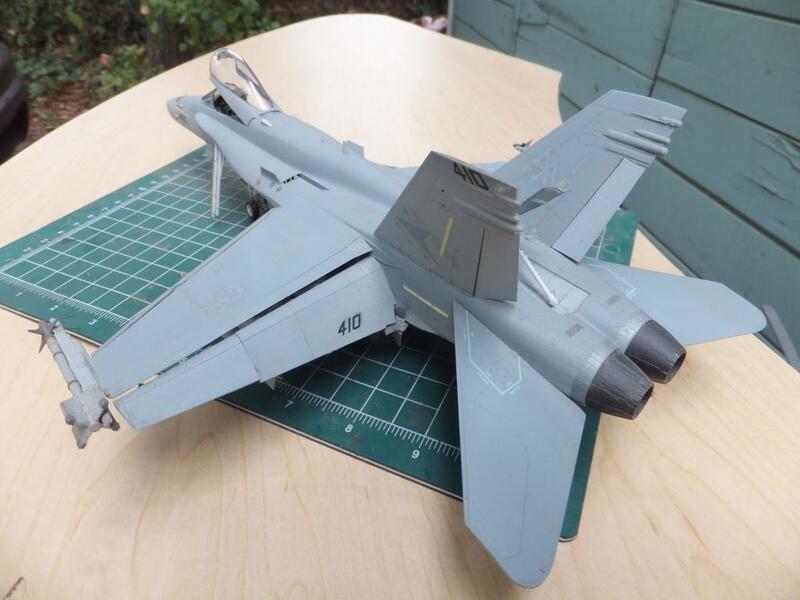 The Monogram F/A-18 was 15.00 and can find for 10.00. 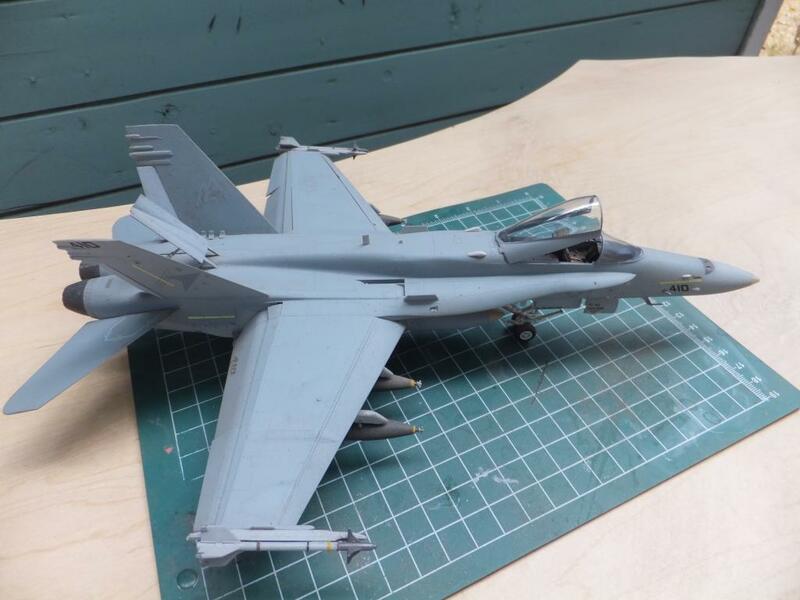 The other offering was Italeri’s F/A-18C was around 25.00. I payed around 30.00 for this from Discount Hobbies mail order Hobbies in Utica, Ny, remember them. Before the internet they were my go to guys for the start of my stash. 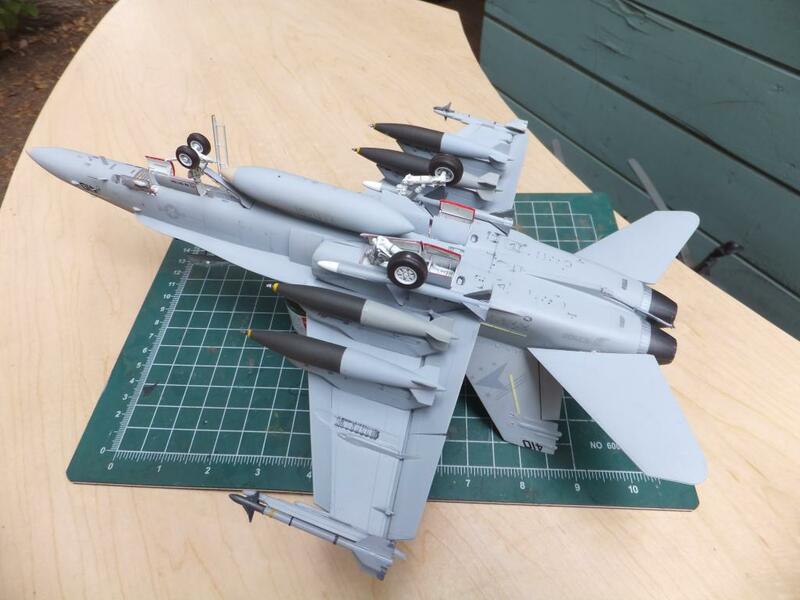 So getting 2 sets of the Hasegawa bomb set to get 4 Mk 84 bombs, at least the sidewinders and Sparrows were in this kit. Using Aeromaster Warbird paints for the #36375 Lt Ghost Grey and #36320 for the Dk Ghost Grey, Reefer White for the gear, bays and internal components. MM Steel for the exhaust cones. Glossy Lt Ghost Grey for the missiles, and OD for the bombs. It was a bit of a challenge but very fulfilling in buidling the kit. 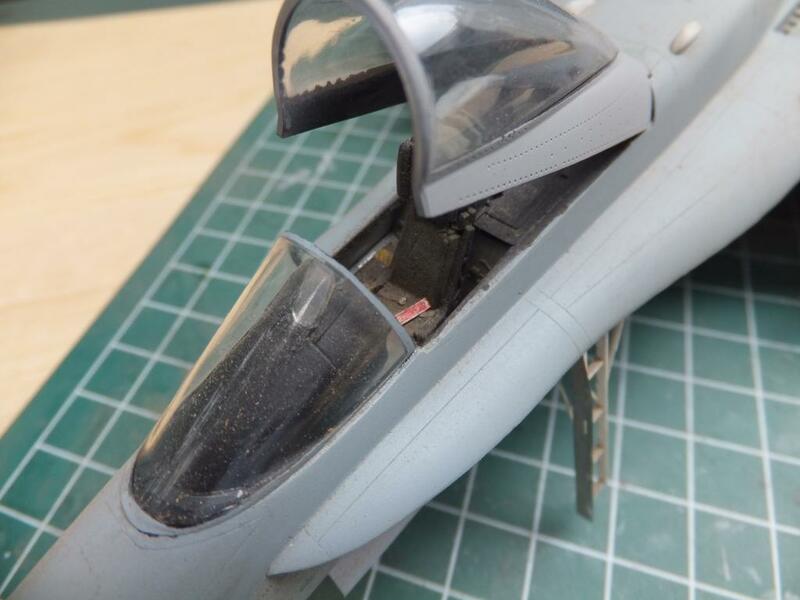 Don’t remember much when it comes to the assembly, though some filler was used under the LEX strakes, which I consider part of the assembly that comes with any kit. With a couple more in the stash a “D” and a Super Hornet “E”. 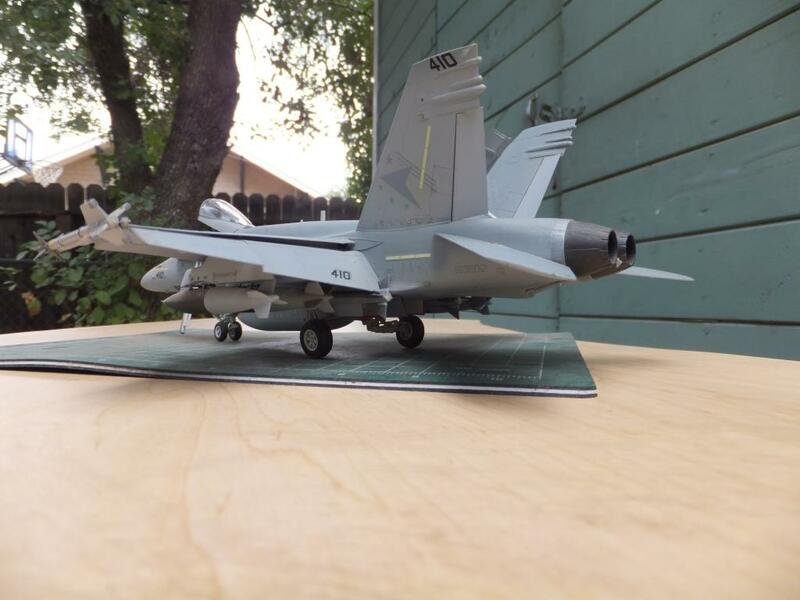 I also have the Revell F/A-18E which is pretty nice. it has been a long time coming to build another in any scale. Thanks for viewing, Happy Labor day and stay blessed. AWESOME!!! Love the bit of history!!! GO NAVY!!! Thank you Morne, as i can say the same for your builds as well. Thanks Bob, tried blowing air with an empty air brush, much better than before as it was really dusty. Couldn’t get all of it. Used Blue Magic to polish the outer surfaces. Love that stuff. WOW Chuck, what a beauty, nice story to it as well. Great build, very well done and an interesting story, love it. Great read, Chuck, and an equally great model. That’s a great looking Hornet. Great story by the way. I spent a day up at NAS Lemoore a couple of years back, guest of the ANA up there. Great guys, great location for flying year round in ‘Bugs’.